The kayaking in Patagonia was tremendous. Continually beautiful. There is something about being on the water that I just absolutely love. The river canyon we paddled was challenging and beautiful, with plenty of excitement for an amateur paddler. Our guide was wonderful, and provided a perfect experience for what I was looking for. If you're a novice and are looking for a 1/2 day or day of kayaking then there are some great opportunities in Torres del Paine (where you could kayak up to a glacier), the Lake District (explore pristine lakes and rivers) or Ushuaia. If you want to get out and explore, kayak by day and camp wild by night then there are plenty of adventures that are well suited to novice kayakers who have a passion for the great outdoors. For experienced sea kayakers there are some audacious and infamous routes: kayaking to Cape Horn, a remote exploration of the Chilean fjords, kayaking deep into the Pumalin national park. Kayaking is popular with visitors to Patagonia of all ages. Although no experience is needed, you must be in reasonably good physical condition and obviously being able to swim is essential! Most operators run trips of groups of up to 12 people: you should expect people of different ages, nationalities and fitness levels. If you are an experienced kayaker then please let us know and we'll hook you up with some of the more advanced expeditions. The Chilean Lake District is famous for its white water rafting and is a great place to enjoy some wild and adventurous kayaking. Kayakers from around the world come to the Futaleufu river known for its strong currents and deep blue waters created by glacial sediment. The Argentinian Lake District or "the Bariloche Lakes" is lush and green and not dissimilar to our own Lake District. The Torres del Paine and Bernardo O'Higgins National Parks contain some very dramatic Patagonian scenery. Here you'll be able to kayak amongst fjords, glaciers and icebergs. Challenge yourself to kayak in and around the wild and remote island of Tierra del Fuego , the 'end of the world' where Darwin's notion of Natural Selection was reputedly born. You can kayak across the Magellan Straits that separate Tierra del Fuego from the mainland, or the Beagle Channel, where you may find yourself paddling amongst a sea lion colony. In Patagonia the weather starts warming up in November with the hottest month in February and the summer ends in March. Although kayaking trips are available throughout the year, going in the warm sunny months is preferable as Patagonian winters can be cold with very strong winds which can result in trips being cancelled at the last minute. Kayaking trips generally tend to be shorter than trekking trips and can last from 1 - 10 days. Accommodation varies from trip to trip dependent on the remoteness of the area you're exploring. There are few hotels outside of the towns! Many trips make use of Refugios (mountain lodges where you'll often share a room with a few others), and there are lots of camping options from eco camps and formal campsites to good old wilderness camping by the side of the river. A couple of kayaking trips include nights sleeping on a boat. It is easy to get to the main airports and towns which serve each of the areas. From there you will need to get a bus to the parks but this is something the operator can advise you on. Bear in mind that you may need to add a day at the beginning and end of your itinerary to factor in flights. To reach the Bariloche Lake District fly from El Calafate or Santiago to Bariloche airport. From here take the 30-minute bus journey into town and then from there to the Lakes. You may have to factor in a day of travelling and stay for a night in Bariloche before your kayaking adventure begins. In the Chilean Lake District, most trips start from the large town of Puerto Montt or the smaller town of Puerto Varas and continue on to the lakes and rivers via bus or coach. You can fly to Puerto Montt airport from Santiago or Buenos Aires. To reach Torres del Paine National Park fly from Santiago to Punta Arenas. Buses run from Punta Arenas to the town of Puerto Natales with a journey time of 5 hours. From Puerto Natales take the bus either to Bernardo O'Higgins National Park or directly to Torres del Paine. The National Park of Tierra del Fuego is served by the town of Ushuaia (the last town in Argentinian Patagonia before Antarctica). There are regular flights from Buenos Aires to Ushuaia airport. For more info see our guide to getting to Patagonia. Can I combine this with something else? Most tour operators offer trips which combine kayaking with trekking. These trips usually take place in Patagonia's national parks and enable you to enjoy trekking through the forest and mountains whilst viewing breathtaking glaciers and kayaking on the pristine lakes and rivers. The landscape of Patagonia is so diverse that some companies offer multisport trips which incorporate trekking, fishing, kayaking, horse riding and ice climbing all in one trip. 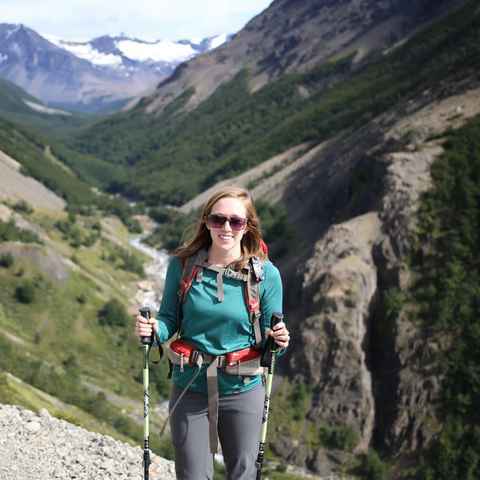 For example see multi activity trips in Torres del Paine. Do I need training before hand? Training will take place during the trip as it is in the interest of every guide that each traveller is well informed of the health and safety issues and is capable of using their kayak. Guides provide a demonstration and a safety talk before you enter the water with your kayak. There are plenty of schools to learn or brush up your kayaking skills before your trip eg. the British Canoe Union.